Connecting with the community helps everyone find a little more joy. Employees from Amica’s Seattle office are doing just that, both individually and as a group. Teams from the office have coordinated group volunteer activities as a way to give back to those in need in their community, while also bonding with co-workers. 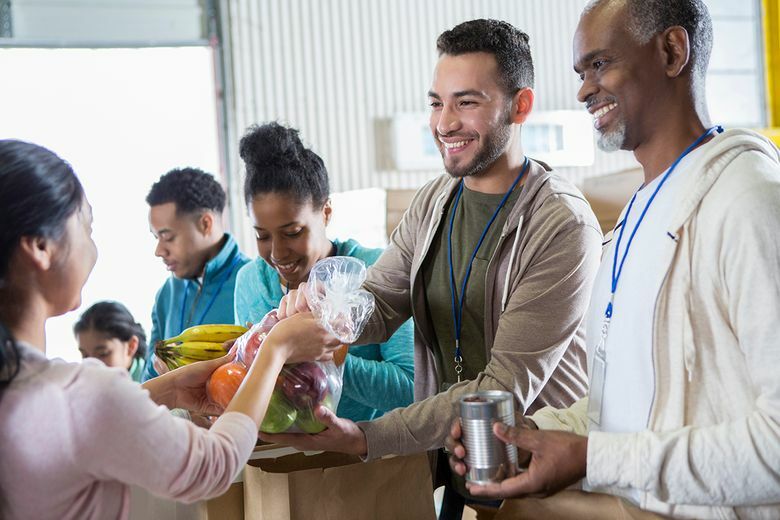 If you’re looking for ways to connect with your community by giving back this season, here are a few organizations where you can lend your support. This combination food bank and family resource center helps support families in need right here in Seattle through clothing, toy and food donations, parenting classes and multilingual playgroups. There are many ways to get involved with this organization in their Wallingford or Greenwood locations. The website lists several upcoming volunteer opportunities, from food drives at local supermarkets and farmers markets, to organizing and distributing food, to being a reading buddy for a young child. FamilyWorks accepts donations of food, clothing, baby items and various household supplies. Amica’s Seattle employees have coordinated two school supply drives, as well as a winter coat drive, to benefit FamilyWorks. If you’re an animal lover, Pasado’s Safe Haven in Monroe, Washington, might be an organization you want to look into. The sanctuary is set on 85 acres and is currently home to about 250 animals, from dogs and cats to everything else you might find on a farm. Pasado’s Safe Haven aims to fight animal cruelty through providing sanctuary and rehabilitation for animals who have suffered from abuse and neglect, while also investigating animal cruelty crimes and advocating for stricter animal protection laws. A good way to maximize your impact with Pasado’s is to organize a “Compassion Day,” a team-building volunteer experience for groups of 10 or more. Your group will get a private tour of the sanctuary and an opportunity to visit with the animals in addition to working together on a project like painting, building, weeding or cleaning to help improve the sanctuary. Every two seconds, someone in the U.S. needs blood. Bloodworks Northwest is our regional blood bank, an independent nonprofit that provides blood supply for more than 90 hospitals in the Northwest. Donating blood is a great way to give back during the holidays, since the holiday season is often when blood shortages at banks occur. One blood donation can save up to three lives. If you aren’t eligible to give blood yourself or want to give with more of your time, you can volunteer with Bloodworks Northwest to assist with donor registration, monitoring, scheduling and transportation. In 2004, Kirkland couple Terry and Rich Colella founded Friends of FSH Research after their son was diagnosed with FSH muscular dystrophy, one of the most common progressive muscle diseases that still has no treatment or cure. Through their organization’s fundraising, they have been able to fund research at the University of Washington, Fred Hutchinson Cancer Research Center and Seattle Children’s Hospital, plus other research studies around the world. If you have a background in scientific or medical research, leadership or event planning, Friends of FSH could be a great place for your volunteer services. The organization uses many volunteers for their annual fundraising event as well. This year’s 15th annual auction and gala event will be on Jan. 26, 2019. Volunteers are needed twice every day at Greyhound Pets, Inc. in Woodinville, Washington, to turn out the greyhounds for some exercise, cleaning and socializing. This nonprofit organization is dedicated to the welfare of greyhounds and greyhound mixes in the Pacific Northwest and Southwestern Canada. They house dogs and work to get them adopted while providing support and veterinary care for them. You can also get your own fresh air and exercise and possibly meet some dog-loving friends in the area while you volunteer for this organization. Every Sunday morning they take volunteers from the kennel to a park for a long group walk. Helpfulness is what life is all about. At Amica, it’s what insurance is all about, too. Amica Insurance offers outstanding customer service you can count on for people throughout Washington state and across the country. Discover Amica today.